It’s summer. There’s plenty of fresh, juicy and sweet fruit on the market. But sometimes you crave for something different. Especially with your afternoon coffee. 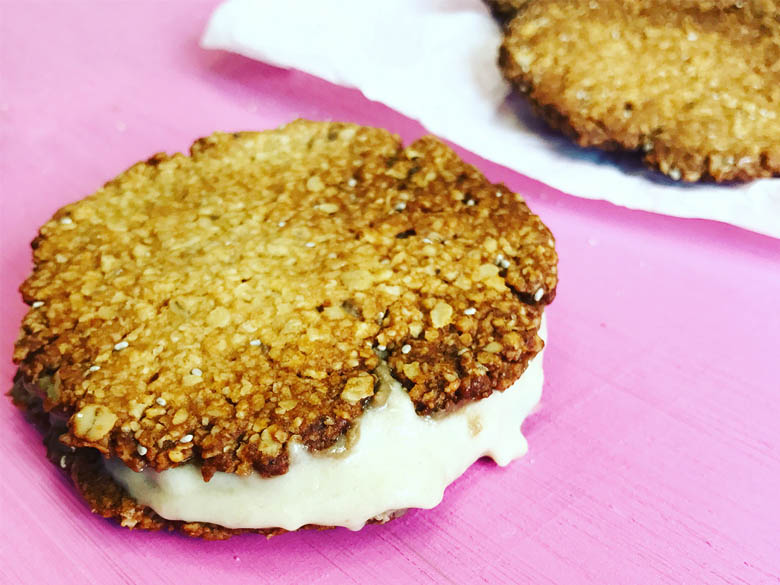 If you think we can’t tempt you with cookies or that in this heat there’s no reason to stay around the oven, we have one compelling argument. It’s an ice cream sandwich. 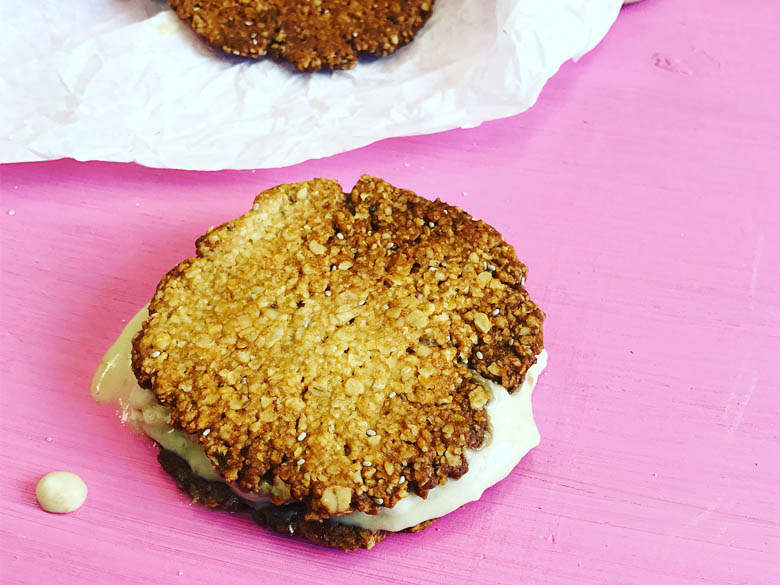 Imagine two thin and crunchy oat cookies with your favourite ice cream or sorbet between them. So, now that we’ve got your attention, we give you our first recipe on the blog. Tip: this recipe is easy to perform and appropriate for children or friends who don’t like to cook. Grind the oats gently. Only 1-2 clicks of the blender / Kitchen robot do a wonderful job. You take a big bowl. Put all products except the chia seeds in it and stir until you get a uniform mixture. Using a tablespoon, distribute the dough in circles with a diameter of 5 cm. Smooth the surface of the delicious piles with the back of the spoon. Sprinkle the raw cookies with chia seeds. Heat up the oven to 180 degrees and bake 13 minutes. After they have cooled off- unleash your imagination. 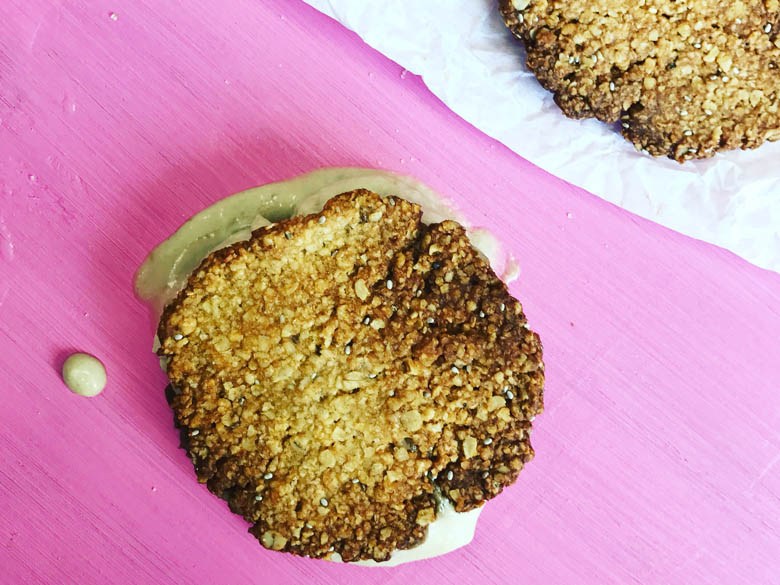 Add them to a sundae, make yourself an ice cream sandwich, or just nibble when you need something sweet. And for good karma points, bake more and take them to the office. Even the colleague who’s always on a diet won’t refuse to try them. ← How to make the perfect imperfect cookies?